The Skokie Valley Symphony Orchestra (SVSO) was founded in 1962 by Dr. Paul Hurwitz and a group of local musicians. The group engaged Dr. Leon Stein to be their first conductor. Several talented musicians in the area began coming to rehearsals and the first performance, with a reasonably full orchestra, was held at Niles East High School. The Skokie Valley Orchestral Association was incorporated that first year as a not-for-profit corporation in the State of Illinois. It has a 501(c)(3) designation from the Internal Revenue Service. Since then, it has served as the parent organization of the Symphony and its purpose is to promote and sustain a community orchestra. It is governed by a Board of Directors that meets at least ten times a year. The Symphony season consists of four (and occasionally five) concerts per season. Dr. Leon Stein led the Skokie Valley Symphony Orchestra from 1962 until 1966. Leo Krakow followed as conductor of the Symphony and held that post for 27 years. During that time the Orchestra became a fine performing ensemble with a reputation that went far beyond the local community and attracted more talented musicians. Following the departure of Daniel Boico, who served as conductor and music director from 2002-2006, the SVSO held a conductor search and the Board of Directors selected Francesco Milioto to be the new Music Director and Conductor beginning with the 2007-08 season. World-class musicians have performed with the SVSO as guest soloists, including Itzak Perlman, Leonard Pennario, Eugene Istomin, Emanuel Ax, Pinchas Zuckerman, Rudolf Firkusny, Jeffrey Siegal, Rachel Barton, Gil Shaham, Mathieu Dufour, and Daniel Barenboim. Another goal of the SVSO has been to encourage young talented musicians to bring quality classical music to their generation. Since 1980, the SVSO has held an annual competition, the Bonnie and Lee Malmed Young Artist Competition to select the finest student musicians from across the country. The winners receive a cash prize and are showcased in performances with the SVSO each season. The first winner was cellist Gary Stucka, now a member of the Chicago Symphony Orchestra. Another winner, Frank Rosenwein, is now the principal oboe with the Cleveland Orchestra and performed as a soloist with the SVSO again recently. In connection with the Young Artist Competition, the Orchestra holds an annual competition for young string players. The Harvey E. Mittenthal Scholarship was established in 1987 by his family as a living memorial to Mr. Mittenthal, a long-time member of the orchestra and Board of Directors. The winners receive a scholarship toward their music lessons and perform with the orchestra for a year. In 1997, the SVSO became a permanent resident of the North Shore Center for the Performing Arts in Skokie. The SVSO has participated in numerous community events. These have included the U.S. Bicentennial, the Village of Skokie Centennial, and the Morton Grove Centennial. The SVSO has given special performances in area parks, performed at the Old Orchard Shopping Center and at the reception prior to the Joseph Jefferson Awards. The concert featuring Gil Shaham in October 2003 was presented in conjunction with the Consulate General of Israel to the Midwest as a memorial concert for Yitzhak Rabin. Outreach activities for children and senior citizens have been ongoing. In recent seasons, the orchestra has continued its outreach efforts, presenting a free concert for 700+ school children and hosting a group of residents from Freidman House, a facility for the blind, as well as hosting members of Wounded Warriors at our concerts. 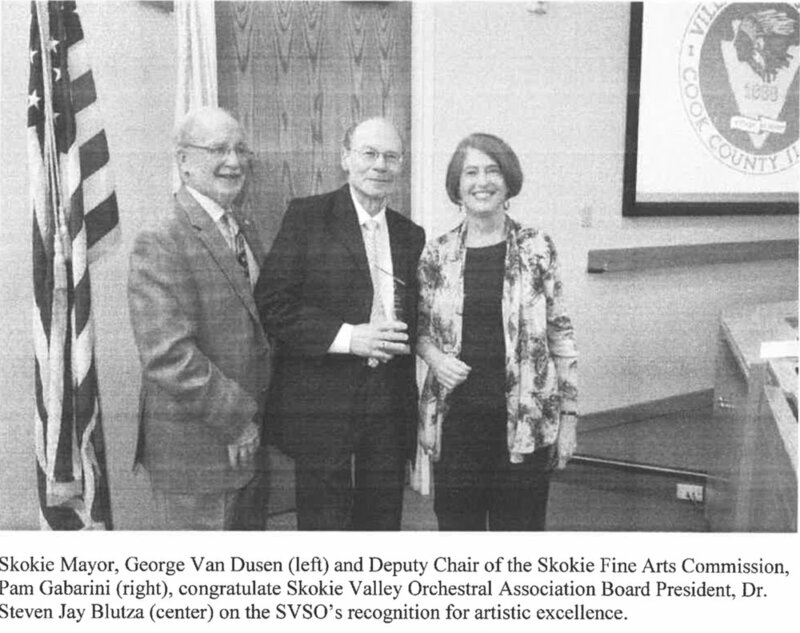 On June 18, 2018 the SVSO was the recipient of The Skokie Fine Arts Commission’s Award for Artistic Excellence in recognition of the Orchestra’s outstanding talent, visibility, and positive impact in the community for over 55 years.